I have not been to Disneyland since 2011 (which I think is tragic), but I’m confident I still love Disneyland. I love the surge of excitement that comes to a peak when I pass through the gates and pass under the tunnel into Main Street. I love mapping out my plan of action. I love riding the same rides I have been riding since I was a baby, or seven, or ten. I love riding the same rides over and over again. I love how the entire park is like a gigantic show. I love the secret nooks. I love the churros. I love how light I feel, and I love how even when I’m soaking wet from Splash Mountain and I’m kind of cold and uncomfortable, I’m still happy because I am HERE, in this magical place. I love the continuity of history; I love the old rides and I love the new rides and I love remembering the rides that used to be here. 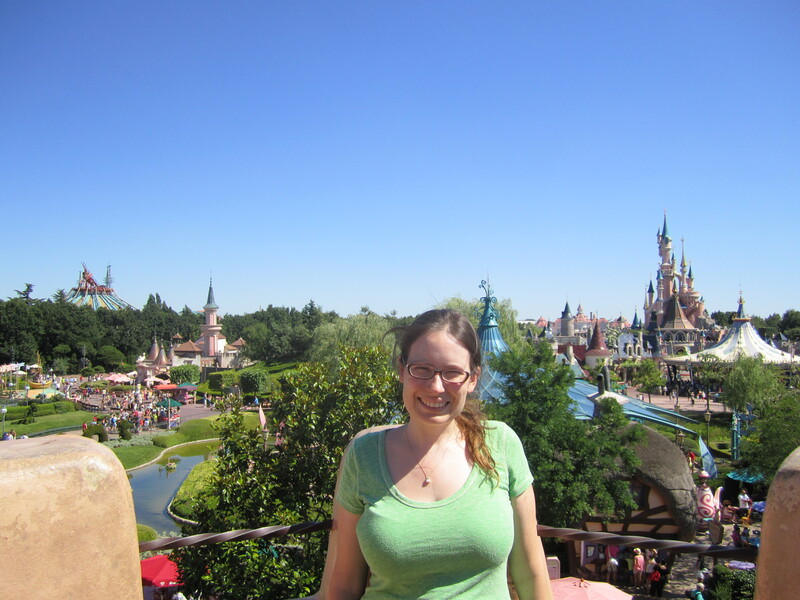 I can’t find a photo of me at Disneyland, but here, have a photo of me at Disneyland Paris instead. I’ve created a Disneyland in my mind, with help from the actual one in existence, that reminds me how joy feels. The uncomplicated, pure joy that I felt when I was six years old pretending to steer a car next to my mom. Don’t get me wrong, I am all for growing up and being an adult. I like being able to make my own decisions. I like being able to protect myself. I like making my own priorities and choosing how I am going to create meaning. But I also like that childhood joy and wonder, and it is something I strive to hold onto. Retaining a connection with that spark of magic makes my life…well, flat-out better. Looking forward to things is fun. Cultivating enthusiasm makes the same experiences more exciting. And all of this encourages gratitude. And if you look at many of the things I feel most strongly about today, many of them are markers for that joy. They are reminders of that wonder. They are evolutions of things I have loved for a very long time. We’d play pretend Disneyland in the backyard as kids, we loved it so much. There’s a video of me, maybe four years old, “dancing” to music by walking around in a circle. I sang as soon as I could talk. I wrote as soon as I could read fluently. Once I could read, I inhaled twelve books every two weeks from the library, and then I’d start in on the Reader’s Digest condensed books that lined our bookshelves. Christmas was the most magical time of year. Getting a puppy when I was six was like a dream come true. I climbed Vernal Falls in Yosemite every year of my childhood starting when I was, what, age four? Age five? The Mist Trail, with its rainbows and delicate barriers of condensation, was as close as I could get to the fairyland of the fairy tales I read in bulk. I’m glad I grew up, but part of the reason I feel glad is because I didn’t have to give up the essence of what mattered to me back then. I didn’t have to give up the excitement of what the next day might bring. I didn’t have to give up the wholehearted love I felt for the world around me. I didn’t have to give up the feeling that we live in a world of wonders. Instead, I got to learn that I get to choose. It’s not that I don’t see the hard realities of the world. It’s not that I don’t see suffering, or feel it for myself. It’s not that I’m not afraid of disasters and warfare and hatred, of sickness and pain and death. It’s not that I turn a blind eye to the problems and injustices that surround us all. I see the difficulties, the pain, the ugliness, where we fall short. But even so, I can also tap into that joy. I can remember the parts of the world, and humanity, that make improvement worth fighting for. I can feel the hush of the evening the night before Christmas, when the tree lights shine and my heart is full and the anticipation of tomorrow hangs over me like a mantle. I can feel the love well up inside of me when I look down at the little dog, who is once more lying completely upside down with her legs sticking straight up. I can feel the full rightness of moving my body to music or singing the notes to a favorite song. And I can visit the wishing well outside the Disneyland castle, and I can believe that magic, of a kind, can still be found all around us. Even after working at the park for two summers, I still have all the same feelings of magic at Disneyland. It’s an amazing little pocket of time whenever I’m there.